Bennington Town Hall is located at 205 South Street, Bennington VT 05201; phone: 802-442-1043. The Town of Bennington was chartered in 1749. The town was chartered in 1749 by Benning Wentworth, the governor of New Hampshire. A village site was planned for its center and was eventually established where Old Bennington Village is now located. The relatively level ground and abundant water power to the north and east of Old Bennington soon attracted considerable development. The downtown and village neighborhoods that surround it remain as important commercial and residential centers today. 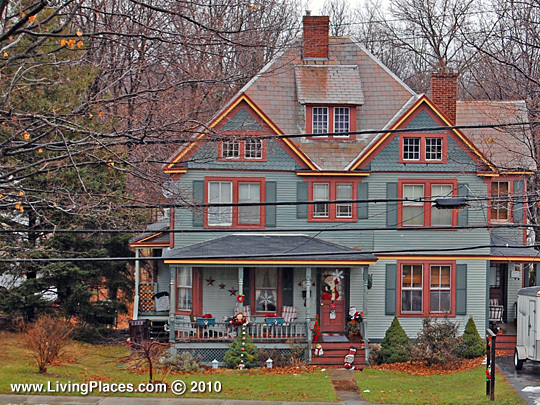 Bennington became an important manufacturing center in the 19th century with mills and factories constructed in the area that is now downtown and along the Walloomsac River and Paran Creek. The textile industry developed into a particularly important component of the town's economic base. In the meantime, agriculture transformed the landscape as farms spread through the valleys and hillsides were cleared for pasture. A network of roads soon connected the villages and outlying areas, and important highways leading to towns and cities to the west, north, and south were laid out and improved. Roadways also were established along different alignments up and over the mountains to the east until the current highway (VT 9), following the Roaring Branch into Woodford, became the principal route toward Brattleboro and the Connecticut River Valley. Trains came to Bennington in the mid-1800s and significantly impacted the town's growth and economic development for many years. The main line passed through North Bennington and a spur provided access to the downtown area where an important train station and rail yard were located. Other connecting rail lines included the "Corkscrew" line that entered town from the west and a line that reached from downtown into Glastenbury in the Green Mountains. Bennington Planning Commission, Bennington Town Plan, March 3, 2010, Hearing Draft, www.bennington.com, accessed May 2010.